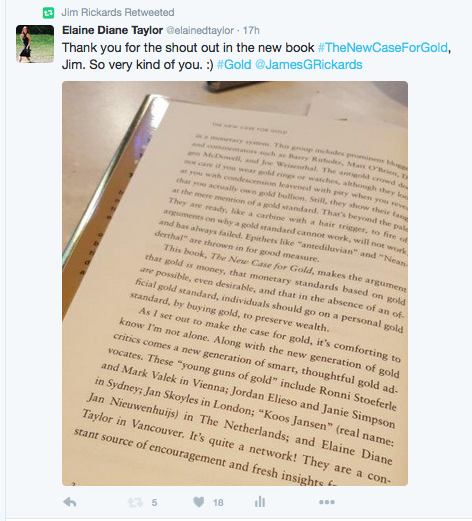 An interview synopsis of Jim Rickards, New York Times bestselling author of The New Case for Gold, The Death of Money, Currency Wars and The Road to Ruin, with Alex Stanczyk from The Gold Chronicles May 2018 vidcast. The U.S. is in a war with Iran using financial weapons. This is the second financial war with Iran. The first went from 2011 – 2013 and is covered in chapter 2 of Jim’s book The Death of Money. There are choke points in the financial system just like there are choke points in geography. For example, if you blocked the Strait of Hormuz, even though it’s only 12 miles across you would be blocking the oil going out of the Middle East to China and other destinations. One of the financial choke points is the U.S. dollar payment system. The digital dollars go through the banks, but the system, called FedWire, is run by the Federal Reserve and the Treasury. In the first financial war with Iran, the U.S. kicked them out of the dollar payment system. This meant that anyone who moved dollars for Iran was breaking the U.S. sanctions and would be arrested. There’s another payment system based out of Belgium called SWIFT. SWIFT is the nervous system of the entire global financial system. It’s where banks of different countries pay each other. During the first financial war, the U.S. worked with their allies and kicked Iran out of SWIFT as well – Iran was “deSWIFTed”. So now Iran couldn’t use U.S. dollars, Swiss francs or euros. What could Iran do? In theory they could ship their oil to India, open an account in an Indian bank and be credited in rupees. But the amounts they deal with are so large that the rupee is not a large enough currency to be feasible for world trade. It meant that Iran couldn’t buy or sell with other countries because they didn’t have U.S. dollars and couldn’t use the payment systems. U.S. dollars were smuggled into Iran from Iraq even though the penalty for being caught was death. There was a run on the banks in Iran. The banks responded by raising interest rates to 20%. The Iranian currency depreciated so much that it was hyper inflationary. So for Iran there was a supply shortage, a run on the bank, interest rates at 20% and inflation out-of-control. There’s no faster way to turn a population against the leaders than inflation. For example, the Tiananmen Square protest in China that turned into a massacre started out as a protest against inflation. It turned into a pro democracy protest, but it started as a protest against inflation. The Iranians were in the same place. They were going down the path towards a regime change. Then the U.S. declared a truce with Iran in December of 2013. Instead of doubling down they decided to negotiate and sign the worst deal ever. It deferred some things a number of years, limited some things and didn’t limit others. Some things were classified at the time and are now declassified. The U.S. gave the Iranians hundreds of billions of dollars. Iran returned hostages so some called the payments a ransom. President Obama said it wasn’t a ransom because, he stated, it was Iran’s money and he was just returning it to them. That turned out not to be true. Some of it was their money and some of it was, as Jim calls it, money you pay to get the deal done. The money was delivered to Iran in physical cash. They didn’t want electronic money because the U.S. could then freeze it again. They wanted cash. The U.S. gave them pallets of 500 U.K. pound notes they bought from the Netherlands central bank, and a lot of physical gold. Jim can’t find the exact figures but believes the U.S. gave Iran about $30 billion U.S. in gold – about 800 tonnes. That’s a lot of gold. Then Iran started spending that money, firing missiles and supporting terrorist groups. The agreement was a large amount of good will in exchange for good behaviour. Iran was given all the good will and then their behaviour got worse. Iran is not transparent so we don’t know how much gold they have. Jim estimates between 1,000 and 1,500 tonnes. That’s not too far behind Russia and behind what China admits they have. So Trump comes along and says the deal is off and that the U.S. is putting the sanctions back on. The European nations don’t agree but it doesn’t matter, it’s based on the U.S. dollar payment system which the U.S. controls. Some say it means Trump changes his mind on deals the U.S. makes, so the U.S. is an unreliable partner. The JCPOA “agreement” (it’s debatable whether it’s an agreement) that Obama negotiated included seven members – five from the UN Economic Security Council – the U.S., China, Russia, the U.K. and France – plus Germany and Iran. The agreement was a loose “Plan of Action” that’s not binding and is questioned as to whether it was even signed. Plus the translation into English is not the same as it is in other languages. So it’s a hot mess. The Iran agreement is basically a handshake deal between two people who don’t trust each other. But, as it is, it says that the President of the United States has to periodically certify that Iran is complying with the terms. Trump did certify the agreement at least twice, maybe three times, but each time he said he wasn’t happy and let them know he might not re-certify it next time. He asked Europe and Iran for a better deal, and they didn’t agree to negotiate so he didn’t re-certify the deal and put sanctions back on. His move was a legal act according to the JCPOA agreement. If Obama had instead negotiated a treaty then it would have be tougher. We’re back where we were in 2012 – 2013 with Iran. The deals European countries have with the U.S. are more important and larger than deals with Iran, so they may not like it but Jim believes they’ll comply with the sanctions. It’s completely false to say there’s only the choice between sticking with the flawed agreement or else war. Those two paths are possible but there are many other paths that are far more likely. With North Korea we were on a path to war by March of this year, but because North Korea and China both believed the path really was leading towards war, then North Korea negotiated. That’s a good thing. Back to Iran. The sanctions will bring the country closer to regime change, and the Iranian people are even more receptive to this message and less tolerant to the Iranian regime than they were in 2012. The sanctions will hit them hard. Jim believes they will come to the table and negotiate a better deal. Who is Iran’s biggest customer for oil? China, by far. The Chinese economy runs on Iranian oil. How will the Chinese pay for their oil? They can’t pay with U.S. dollars or with euro, and the Chinese yuan is not practical because of the size of the purchases. What’s the other option for payment? China can pay Iran for oil with physical gold. China has been acquiring gold like crazy for the last ten years. Officially they’ve tripled their official holdings to about 1,800 tonnes. Jim believes they have more than that. China is trying to catch up to the United States. With the financial reset that is coming down the road, how much more gold will China need in order to pay Iran for oil? These events are a huge upside for the demand for gold at a time that global mining output is flat and not growing, at about 2,100 tonnes per year. It’s getting extremely difficult to find. The beauty of gold is that it’s non-digital. It can’t be hacked and it can’t be frozen by governments. It’s also fungible. China has a large refinery system and could take any gold bar with a serial number and melt it down. This time with the sanctions Iran is a little weaker and the screws are a little bit tighter. So it makes China a little more desperate. The U.S. has sanctions on Russia because of the Ukraine and Crimea. They’re serious sanctions. Russian global corporations cannot refinance U.S. dollar denominated debt in western capital markets. They beg the Russian central bank for dollars, but the CB won’t give them the money. The Russian sanctions have been on there for a while, and now there are sanctions on China related to theft of intellectual property, which is estimated at $1 trillion. Venezuela is also sanctioned with maximum pressure. So Iran, Russia, China and Venezuela are all out of the global payment system. The only reason the U.S. can do these sanctions and kick them out is because the U.S. controls the dollar payment system, along with their buddies who control SWIFT. Those kicked out want another system. The dollar system is too big and they can’t fight it, so they want another system. They’re working on it using blockchain, distributed ledger technology, physical gold, and proprietary internet. These countries are getting closer, perhaps in the next two years, where they develop something they might call the “World Coin”. They’ll use encrypted distributed ledger, but Jim doesn’t believe it will be bitcoin. It will be a worldwide cryptocurrency that is secure and encrypted, used for payments between nations. Christine Lagarde, Chair of the International Monetary Fund (IMF), at the IMF Spring Meeting said that the time had come to look at expanding the SDR (Special Drawing Rights). They are conducting studies for its expansion, and using blockchain technology they could develop the eSDR, a digital SDR. The success of the sanctions against other countries may actually lead to the demise of the U.S. dollar as the world reserve currency. A reset is coming. So it’s a good idea to have some physical gold held in non-banking storage. Not all in. Just a portion of your assets. Jim is a U.S. citizen and a patriot, which is why he’s warning the U.S. officials. He says the military listens more than the Treasury does. The Treasury thinks Jim’s exaggerating and the U.S. dollar will always be the world reserve currency. The military takes it in and agrees they have to think about how they would function in a world where they work in a currency they don’t print. Gold is at $1,317.90 U.S. per ounce. I’m in Vancouver still, and soon off to the interior of B.C., close to the Gold Rush Trail for a few months of jewellery, music and gold work. The reset is coming, and things are quiet while the behind-the-scenes players are setting up and trying to gain advantage. New tech is developing, quantum computing is a race for mastery. As Alex Stanczyk said into today’s vlog, the first to master quantum computer will have the decided advantage in the new global crypto monetary system. Don’t think that because it’s still, and the price of gold isn’t doing much, that the world is without movement. A standing wave is tension. A swing is pulled back before it’s released on its pendulum and carries the child up, up higher and higher. Are there any introduction topics to gold that you’d like to see covered? What is the IMF? Who are the players up high who make the world decisions on money and why should we care? The history of gold as money and why that matters? How to gold pan or how it’s refined? My site and material isn’t heavy with data, because I believe there are many who do that well, and sometimes we want to share what we believe about gold without overwhelming a new person. Ambient peace is about living a life that is sustainable, not because it’s always the same, but because you hedge, or shield yourself from forces too strong to come against alone. That’s the world of gold. Beautiful. Truthful. The most condensed energy there is. Non-reactive. Value. Eternal. The thing you can count on to not fall apart even under intense pressure. Like love. Like your value. We change and grow under pressure, and then expand in joy when the pressure is gone and the wheel turns again. As The Art of War speaks about, to pay attention and win depends on the flow of energy and reading those signs. I see gold as a microcosm of our greater world and universe. I think that’s why I want to capture it in glass to wear as jewellery. Unrefined and pure before it’s shaped and reshaped. Like a symbol of what is wild inside us all. For me that’s expressed in music, words and jewellery as art. The pendant will be released on July 1st and this site will be reborn and the 3 Minute Gold News will move to another site with more consistent gold news.